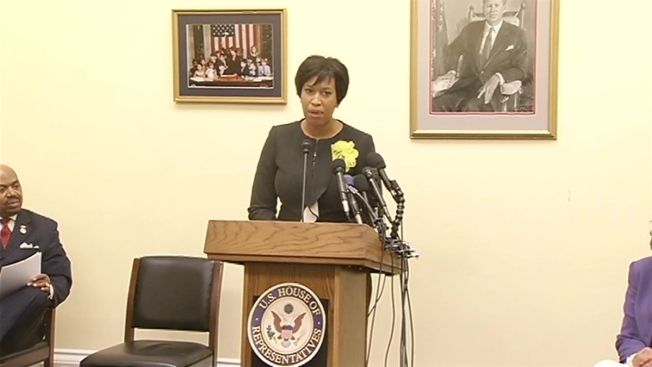 Four years ago, Muriel Bowser was arrested on Capitol Hill during a statehood protest. Today, D.C. statehood is still high on her agenda. Bowser appeared on "Meet the Press" with Police Chief Cathy Lanier and Schools Chancellor Kaya Henderson Sunday and said she wants to "remind everybody that [the District] is 660,000 taxpaying residents." Appearing with D.C. Delegate Eleanor Holmes Norton on Capitol Hill Monday, Bowser said she also doesn't want the district to be retroceded to Maryland, joking that it's not just "west Hyattsville." The city has been treated unfairly for too long, she said. Bowser announced that she would set up her own Capitol Hill office rather than depend solely on Norton.